The Smihs Original Promo Poster from the single "Shoplifters Of The World Unite" distributed by The Cartel. Elvis Presley, first official press photograph. Click on the image to look at it closely in order to see all the details. That poster has been bought to a trusted source that confirms its autenticity. 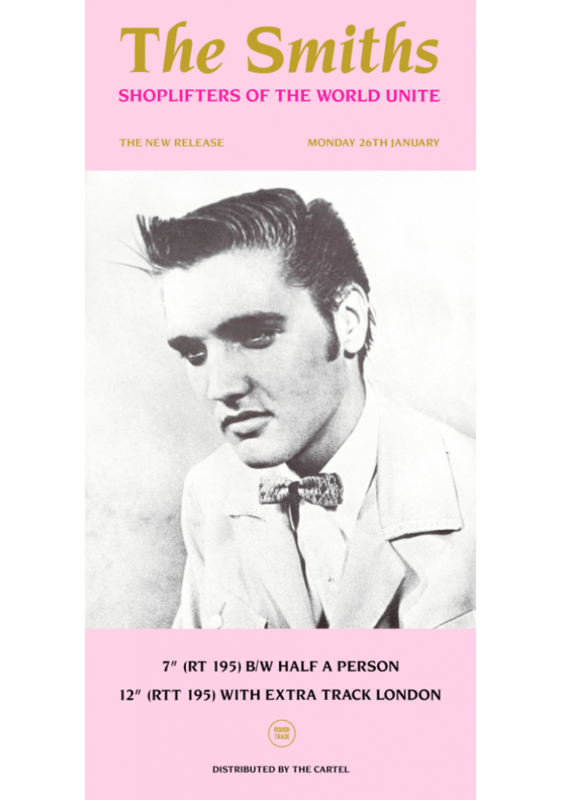 The Smiths Shoplifters of 1987 single Shoplifters of the World Unite featuring one of Elvis Presley first pictures..Printed in England by "Limited Edition'.Ref. on the back: LE261 - The Smiths.. Excellent Close colour postcard of Morrissey when playing with The Smiths wearing an Elvis Presley t-shirt.Printed by Underground.Ref. on the back: LE 375 - Smiths / MorrisseyCondition: Ve..